The Milwaukee Brewers made a flurry of roster moves Thursday afternoon, highlighted by the return of left-handed starter Wade Miley. 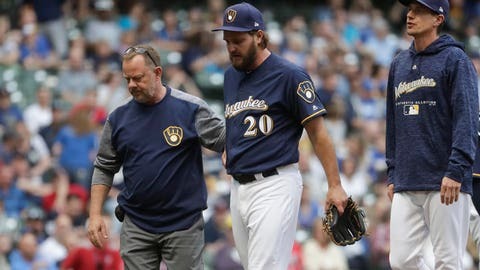 Miley had been on the 60-day disabled list since May, and has appeared in just two games for the Brewers after impressing during spring training. He’s set to start Thursday night against the Pittsburgh Pirates. Miley spent four seasons with the Arizona Diamondbacks before bouncing around the American League from 2014-17. He signed a minor-league deal with the Brewers in February. Meanwhile, the Brewers parted ways with versatile infielder Eric Sogard. Sogard has hit just .134 this season for Milwaukee and .229 for Triple-A Colorado Springs. Fan-favorite infielder Nate Orf and right-handed pitcher Jorge Lopez were optioned to Triple-A, while right-handed pitchers Alec Asher and Adrian Houser were recalled. Meanwhile, right-handed starter Freddy Peralta is staying as close to Milwaukee as possible. Peralta was optioned to Single-A Wisconsin in a move that was likely procedural. The 22-year-old has impressed as a starter in his rookie season, but wasn’t scheduled to pitch again before the All-Star break. Orf made his major-league debut earlier this month, registering just one hit in 14 at-bats while playing second base, shortstop and third base for the Brewers. Lopez has made nine relief appearances for the Brewers this season, allowing 16 hits and six runs in 16 2/3 innings. Asher has pitched two innings for the Brewers this season, and has a 4.62 ERA in 13 appearances for Colorado Springs. Houser was last with the Brewers in late June, and is perhaps most famous for vomiting twice during the eighth inning of a loss to the Philadelphia Phillies last month.